The governor objects to appearing onstage with candidates Eliot Cutler and U.S. Rep. Mike Michaud. Gov. 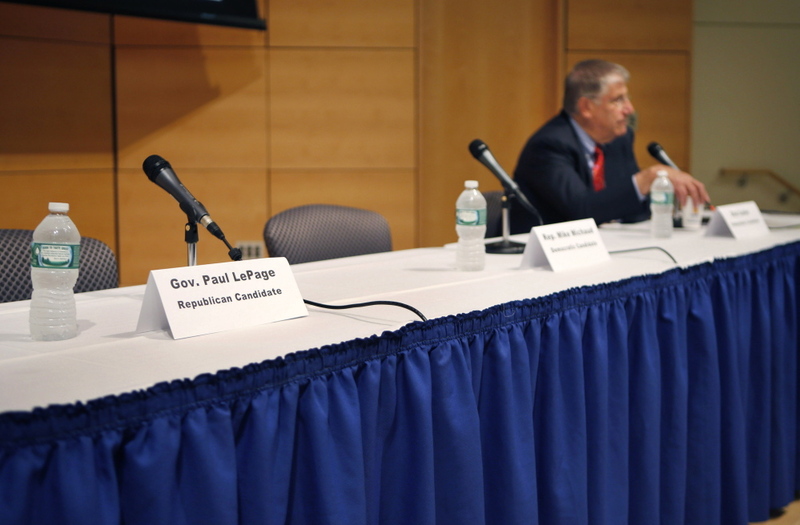 Paul LePage pulled out of a long-planned energy forum at the last minute Friday, surprising organizers in a move he attributed to miscommunication but that others called a calculated political maneuver. LePage and his opponents in the governor’s race, Democratic U.S. Rep. Mike Michaud and independent Eliot Cutler, all had previously agreed to speak and answer questions from a group of more than 250 members of Maine’s energy and environmental sectors gathered at the University of Southern Maine. 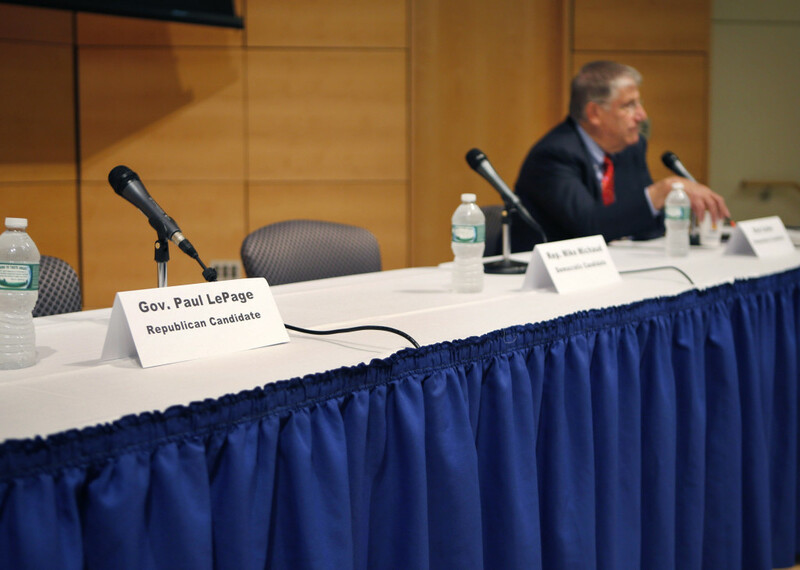 However, LePage refused to participate after his campaign staff arrived at the event early Friday and learned that he would share the stage with Michaud and Cutler. “There was a misunderstanding in the format. We thought we were going into a format and at the last minute there was a different format,” LePage said later Friday morning at another event in Portland. “You know, you’ve got to keep the integrity of the process. If we set a format, we have to stick to what we agreed to. Both Michaud and Cutler, however, said they were not at all confused about the process outlined by event organizer E2Tech, the Environmental & Energy Technology Council of Maine. Jeff Marks, E2Tech’s executive director, suspected that campaign considerations had trumped the need to discuss energy policy. Pete Didisheim, advocacy director for the Natural Resources Council of Maine, said the attendees were generally confused about what was going on, particularly because the stage was empty for the first half hour. The forum, called Heat of the Moment, had been planned for months as part of a morning-long presentation that included state energy officials talking about how Mainers can keep warm this winter in the face of high energy costs. According to emails from E2Tech to the campaigns, the candidates were told that they would each have a half-hour block to address the audience. They could give a speech and then take questions with the remaining time. The emails indicate that the candidates were free to attend as much of the event as they wished, but were really only responsible for their half-hour block. Marks said there was no discussion about the seating arrangement because he didn’t think it would be an issue. David Farmer, a senior campaign adviser to Michaud, said the congressman expected there would be some overlap among the candidates’ remarks. Cutler apologized to the audience before his speech and said afterward that his understanding of the event was the candidates would be onstage together. This is not the first time LePage has withdrawn from an event. Last month, he backed out of a forum hosted by the Agricultural Council of Maine, citing a scheduling conflict. In 2010, about a week before the election, LePage dropped out of a debate hosted by the Maine Public Broadcasting Network, saying that he would rather meet with voters. Democratic candidate Libby Mitchell also dropped out of a pair of events in 2010 because they didn’t feature all five candidates. There is some debate about whether LePage actually arrived at the event Friday morning. Marks said he spoke with LePage’s campaign manager, Scott Van Orman, and his scheduler, Lauren LePage, but did not actually see the governor. Others in attendance said they heard LePage was waiting in a vehicle in the parking lot attached to Hannaford Hall on the USM campus. Marks said forum organizers tried to work through the governor’s concerns. At one point, before Michaud arrived, Cutler was sitting onstage alone. After hearing of LePage’s concerns, Marks said he asked Cutler if he would mind vacating the stage while the governor spoke. Cutler obliged, Marks said, but the LePage campaign still refused to participate. By that point, he was already on his way to another event, according to his campaign. After the confusion, organizers tried to bring the forum back on track, with Michaud addressing the crowd, followed by Cutler. The two men took turns at a lectern behind a table with three chairs and microphones. Marks said his organization has hosted dozens of forums featuring candidates and has never had anything like this happen.